Source: Based on character created by Earl Derr Biggers. On a foggy night on board the ship Newcastle, bound for Samoa and Australia, undercover agent Scott Pearson tells detective Charlie Chan that he is being sent to Samoa to investigate the sudden appearance of money and artworks stolen from Philippine banks during the Japanese invasion. Later, while the passengers gather in the salon for a ceremony to celebrate the crossing of the equator, Pearson is stabbed in the back and killed. 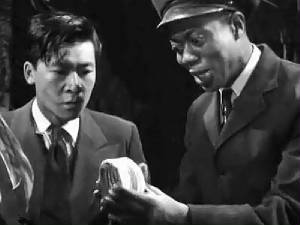 After warning the other passengers to stay where they are, Chan and Captain Black examine Pearson's room and discover that it has been searched. Black reassures Chan that Pearson's portfolio is in his office safe. Chan notices that Pearson's documents mention a man named Lane, but do not identify him. Chan questions the ship's passengers, who include Freddie Kirk, an exhibition knife-thrower, P. T. Burke, a trader in cotton goods, Professor Henry Martin, an ichthyologist, Henry's wife, Cynthia, Tao Ericson, a half-Polynesian who owns a restaurant on Samoa, Tao's Polynesian wife, Laura, missionaries Rev. and Mrs. Whipple, and Rona Simmonds, an English tourist who is in love with the ship's purser, George Brace. After he dismisses most of the passengers, Chan speaks privately to Rona and George, and, while advising them to speak the truth, asks them to identify Lane. However, George insists that they have nothing to reveal. none. Chan then learns that Burke and Kirk are blackmailing Rona. 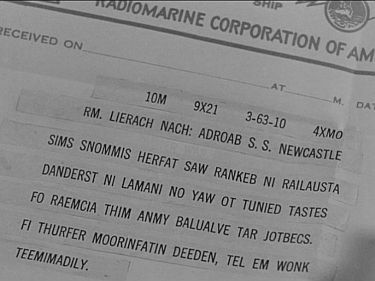 The Newcastle docks in Samoa, and Charlie has twenty-four hours to solve the murder before the ship departs for Australia. 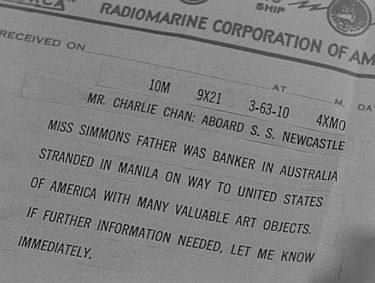 Chan's number three son, Tommy, sends him a coded telegram explaining that Rona's father was an Australian who was stranded in Manila during the war with valuable art objects, and that Rona is now searching for them. Chan discovers that Rona is traveling under papers that were falsified by Brace, and that is why Burke is blackmailing her. 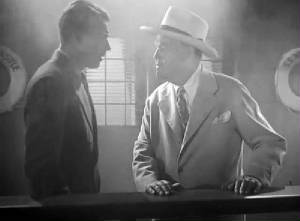 Chan questions, Burke, but the latter is suddenly killed by a thrown knife before he can reveal anything. Meanwhile, Jimmy and his assistant, Chattanooga Brown, stumble upon money that is hidden in Professor Martin's fish museum that is located near the Ericson's restaurant. After Kirk is killed, the rest of the suspects converge on the museum. Chan learns that Whipple is the head of the gang, which includes the Erickson's, Burke, and Kirk, and which had planned to sell the stolen artworks. The Whipples are then revealed to be Lane and his valet, Joseph Murdock, who was dressed as a woman. Murdock, the murderer, had shot knives at his victims from a special gun and was thus able to escape detection. 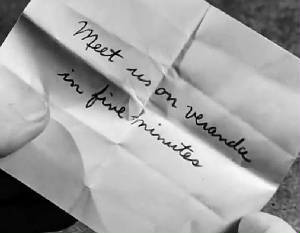 NOTES: The film's working title was Hot Money. 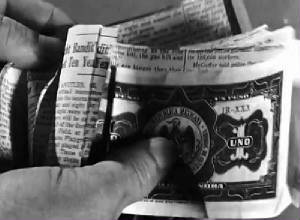 The title card reads, Charlie Chan in "Dangerous Money". Hollywood Reporter news items add the following information about the production: Prior to his appearance in this film, Rick Vallen served a term in the U.S. Coast Guard. Restaurateur "Don the Beachcomber" gave technical advice on the South Sea Islands. It was the wish of Jack De Witt, the actual writer of the screenplay, to credit his wife, Miriam Kissinger as the writer. Problems rarely wait for clearing weather. There is old saying: "Good wife's place should be at mate's elbow in time of trouble." Tiger going away from village is never feared. Guilty mind sometimes pinch worse than ancient boot of torture. Hasty man could also drink tea with fork. In phraseology of Euclid, X over Y equal proposition still unsolved. Each country's dance most beautiful dance in that particular country. Kangaroo reaches destination also by leaps and bounds. Good hunter never break twig under foot. CHARLIE CHAN'S PLANNED DESTINATION AND HIS REASON FOR SAILING THERE: "...commitments in Sydney, Australia..."
ACCORDING TO HAROLD MAYFAIR, THE ORGANIZATION TO WHICH PROFESSOR HENRY MARTIN BELONGED: "...the International Society of Icthyologists." THE STATED LENGTH OF TIME THAT HAROLD MAYFAIR HAD BEEN PROFESSOR MARTIN'S ASSISTANT: "Two years." ACCORDING TO DR. MARTIN, THE LENGTH OF TIME SINCE HE ESTABLISHED HIS ICTHYOLGICAL MUSEUM IN PAGO PAGO: "...six years ago." 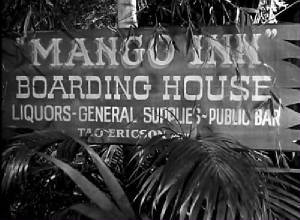 ACCORDING TO TAO ERICSON, HIS HOME: "I have lived in Pago all my life." TAO ERICKSON'S STATED PROFESSION AND PURPOSE OF HIS TRIP: "I'm a trader. Just back from Honolulu - buying trip." THE STATED DESTINATION AND PURPOSE OF RONA SIMMONDS' TRIP: "I'm going to Apia [Western Samoa] - the Robert Lewis Stevenson shrine." THE DESTINATIONS AS MENTIONED BY FREDDIE KIRK: "I'm bound for Wellington (New Zealand), Sydney (Australia), change ships in Suva (Fiji)." 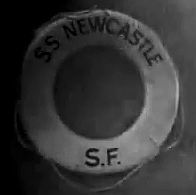 ACCORDING TO JIMMY CHAN, THE CHAN PARTY'S CABIN ABOARD THE S.S. NEWCASTLE: "Cabin 8." THE SHIP'S DOCTOR'S "DIAGNOSIS" FOR CHATTANOOGA BROWN'S "AILMENT": "This is Hydrophobia Deformance. Prognosis: uncertain. Therapy indicates immediate removal of the liver." JIMMY CHAN'S CODE NAME: "Chop suey 108"
CHATTANOOGA BROWN'S CODE NAME: "Pork chop 711"
BIG BEN'S STATED SELLING PRICE FOR A PAIR OF "LOADED" DICE: "$10, American money." ACCORDING TO RONA SIMMONDS, THE FACTS REGARDING THE FIRST MISSING PAINTING DISCOVERED IN PROFESSOR MARTIN'S MUSEUM: "The Gauguin belongs to Mr. Fitzmorris, the banker at Wellington (New Zealand)." ACCORDING TO RONA SIMMONDS, THE IDENTITY OF THE MISSING MINIATURE DISCOVERED IN PROFESSOR MARTIN'S MUSEUM: "Mrs. Usher's miniature." Gauguin (Paul Gauguin) - (1848-1903) A French Post-impressionist painter who travelled to the South Seas to live and work. Rona Simmonds: "The Gauguin belongs to Mr. Fitzmorris, the banker at Wellington." Kanaka - A South Sea Islander, especially one brought to Australia as a laborer in the 19th and early 20th centuries. Often used disparagingly. P.T. Burke: "You look for a Kanaka or a Melanesian..."
Kansas City bankroll - (Slang) A term for a roll of money that is actually a few bills of high value rolled around those of lesser or no value fashioned to appear as a big roll of money. Jimmy Chan: "It's a Kansas City bankroll." Melanesian - A member of any of the indigenous peoples of Melanesia, a division of Oceania in the southwest Pacific Ocean comprising the islands northeast of Australia and south of the equator. It includes the Solomon Islands, Vanuatu, New Caledonia, the Bismarck Archipelago, various other island groups, and sometimes New Guinea. oodles - (Informal) A very great quantity of something. Jimmy Chan: "Hey, Pop, we found it! Oodles of it!" pea-souper - A thick, heavy fog. P.T. Burke: "Say, it's a regular pea-souper, ain't it?" Robert Lewis Stevenson - (1850-1894) Scottish essayist, poet, and author of fiction and travel books, best known for his novels Treasure Island (1881), Kidnapped (1886), Strange Case of Dr. Jekyll and Mr. Hyde (1886), and The Master of Ballantrae (1889). In 1889 he and his family set out for the South Seas, settling on the island of Upolu in what is now Samoa. There Stevenson gained the affection of the natives, who knew him as Tusitala (teller of tales). He died in Samoa and, by his own request, was buried high on Mt. Vaea "under the wide and starry sky," which he described in his famous poem Requiem. Dangerous Money - Rosa Simmons: "I'm going to Apia - the Robert Lewis Stevenson shrine." Siva Siva (Siva Samoa) - A traditional Samoan dance which requires the dancer to exhibit a particular grace of movement involving the arms and hands. Laura Ericson: "But our Polynesian Siva Siva seems loveliest to me, Mr. Chan." P.T. Burke: "Haven't seen that Vaudeville guy, have you?" Wellington - The capital of New Zealand. Freddie Kirk: "I'm bound for Wellington, Sydney, change ships in Suva." 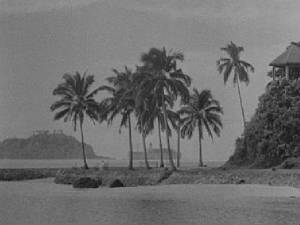 In Dangerous Money, we see the S.S. Newcastle arrive in Pago Pago, American Samoa through the use of stock footage. The ship shown as the Newcastle is probably the S.S. Mariposa which belonged to the famous Matson Navigation Company. 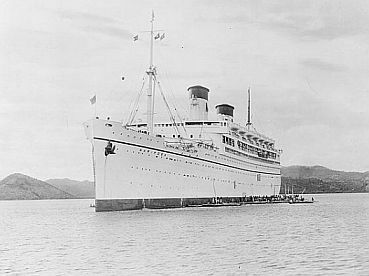 The Matson "white ships" became famous for their service to the Hawaiian Islands as well as other Pacific destinations, including Pago Pago, American Samoa. 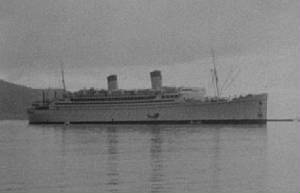 The S.S. Newcastle at Pago Pago as seen in Dangerous Money. The Matson liner S.S. Mariposa. As the ship carrying Charlie Chan arrives we see a sweeping panorama of the bay at Pago Pago. We also see a distinctive feature, a U.S. 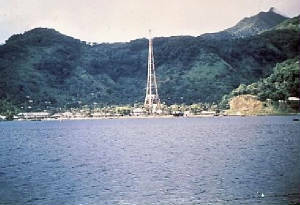 Naval radio tower. Pictured below is this tower as seen in Dangerous Money. 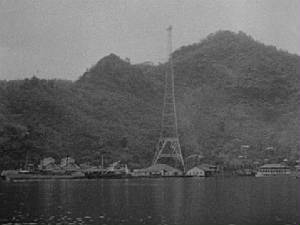 Below that is a photograph featuring that same tower taken by Dr. Jim Harris, a Navy doctor stationed in Pago Pago in 1948, just two years after Chan's visit to the tropical port.